This letter was written by William Whitaker (1835-18xx), a member of Kirkwood’s Rangers — an independent cavalry company under the command of Capt. 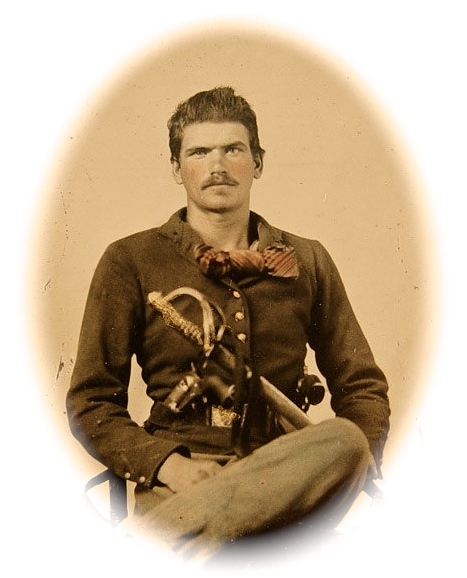 William McCreight Shannon (1822-1880) of Kirkwood, South Carolina. This company was later (1864) combined with Holcombe’s Legion to form the 7th South Carolina Cavalry. William Whitaker rose to the rank of sergeant during the war. This letter was written from the vicinity of Richmond in May 1862, just 1 week prior to the Battle of Seven Pines in which William’s unit was engaged. 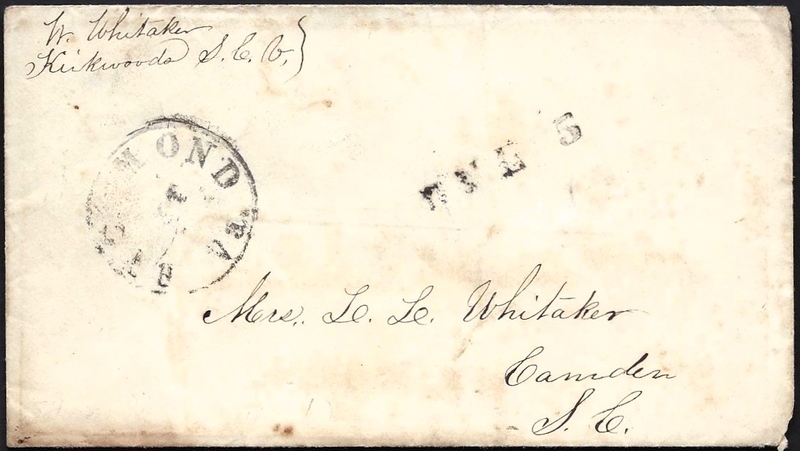 William addressed the letter to his mother, Helen (Muir) Whitaker (1806-1879), the wife of Lemuel Lawrence Whitaker (1800-1864). The letter was sent to his father’s plantation near Camden, Kershaw County, South Carolina. The Whitaker family members are buried in the family plot at Quaker Cemetery in Camden. W. Whitaker, Kirkwood’s S. C. V.
I received yours and sister’s letters a day or two ago and I delivered both of Proctor’s to him. I see him very often now as he is only two miles from our camp. We are still about five miles from Richmond and I expect will remain here sometime now from all appearances. You had better send our clothes together as I expect we will be near each other for sometime. I will be obliged to you if you will send that pair of shoes which I took as I let brother have the pair I brought with me as they were worn and better for walking, and I will need a pair this summer. I believe all you have to send me is my under clothes & one thin pair of pants. You can also put in a couple of towels. ¹ S. Guggenheimer (1819-18xx), a Jewish German immigrant, was the proprietor of a clothing and dry goods store in Richmond, Virginia.